A 'Tough, Smart, Proud Town' Meets Terror With Determination The bombing attack at the Boston Marathon Monday could have caused scrambling and panic. Instead, the tragedy revealed the city's character as people rushed to help each other. 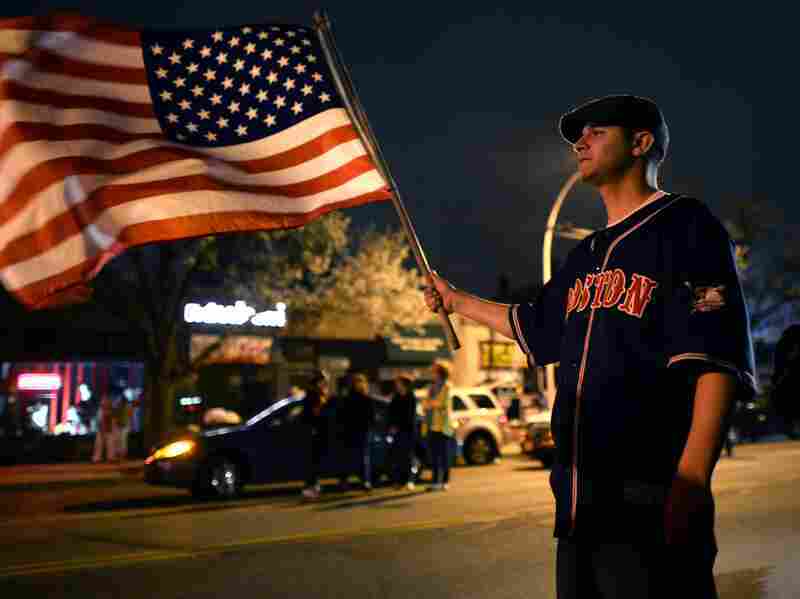 Boston residents celebrated Friday night after law enforcement officers captured one of the two suspects in the Boston Marathon bombings. It has a history of hard racial attitudes and professed liberal politics, lots of Nobel laureates and, historically, more than a few ignoble pols. It's the city of splendidly posh museums and tightly-packed neighborhoods, where people know how to batten down doors against storms, get snow off the streets and keep going. You could see a big streak of Boston when Mayor Tom Menino stood up to speak at this week's prayer service. He had just signed himself out of the hospital where he was recovering after surgery. The mayor still had a hospital bracelet strapped around his wrist. He had hospital machines that kept him going, cloaked by a sheet on his lap and he was steered to the podium by his son, a Boston police officer, who had been at the finish line of the marathon. But the mayor of Boston insisted on getting out of his seat to stand at the podium and tell his city in a hoarse, husky voice that crackled like the wheels of one of Boston's T trains when he said, "We are one Boston." This week's assault and tragedies in Boston could have caused scrambling, fright and panic. Instead, they revealed character. People ran unflinchingly into smoke, fire and blood. They worked through weariness, opened their arms and gave of their hearts. Friday night, I got an email from my friend Gordon. He works in a restaurant and opened the doors so people from the race could stumble in for shelter and comfort. Friends who run a family bakery nearby came in crying. "It will be some time before my anger subsides," Gordon said. The restaurant, which is usually bright and loud with laughter, has been quiet and somber. "Boston's characteristic cocky humor is taking a backseat," he said, but adds, "I was struck by the calm, serious resolve not to be intimidated. Boston is a tough, smart, proud town. We know what's important ... Bostonians refuse to lose our trust for one another." And when police arrested the 19-year-old suspect Friday night, Boston ended a week that opened with a vicious crime of violence with an act of justice.